As National Afternoon Tea Week (14th to 20th August 2018) rapidly approaches, Jon-Paul Reed, Group Food and Beverage Director at De Vere – a collection of country estates with luxury mansion houses at the heart – gives his top tips to help you recreate a memorable afternoon tea soiree at home, with a slice of hotel-inspired luxury. Sandwiches and scones are the staple of a classic afternoon tea, however, you may choose to serve something a little different to cater to everyone’s taste and dietary requirements. Try experimenting with the fillings in your sandwiches and the flavours of your cakes, for example, you could serve Earl Grey-infused tea cakes, scones with lemon curd or basil macaroons. Although you may be excited to serve your latest flavoursome concoction, make sure that you keep some of those classic ‘crowd pleasers’ on the menu, namely; egg mayonnaise sandwiches, cucumber with cream cheese and smoked salmon sandwiches, macarons, Battenberg and éclairs. It’s hard work being the host and the chef, especially if help is limited, so keep things simple to ensure a stress-free day by preparing as much as you can before your guests arrive and avoid any last-minute meltdowns. It’s true that nothing beats a warm scone with lashings of fresh strawberry jam and clotted cream, but you can bake them in advance and then warm them in the oven before serving. We’d advise, however, leaving it to the guests to decide which is spread first – jam or cream? Our Champagne Afternoon Tea package is extremely popular with guests being served a glass Lanson Champagne alongside their tea. Prosecco, Cava or an English sparkling wine would provide a perfect alternative to complement to your afternoon tea if you’re watching the pennies. And for an added twist, try serving your favourite tipple with a splash of elderflower or raspberry liqueur. De Vere’s collection of country estates provides the perfect setting for everyone, whether that’s in the newly refurbished Orangery overlooking 200-acres of parkland at De Vere Selsdon Estate in Croydon, or sipping tea like royalty on the terrace of the Wokefield Mansion House, facing the same spot Queen Victoria famously took her tea under the large Cypress tree in the estate grounds. 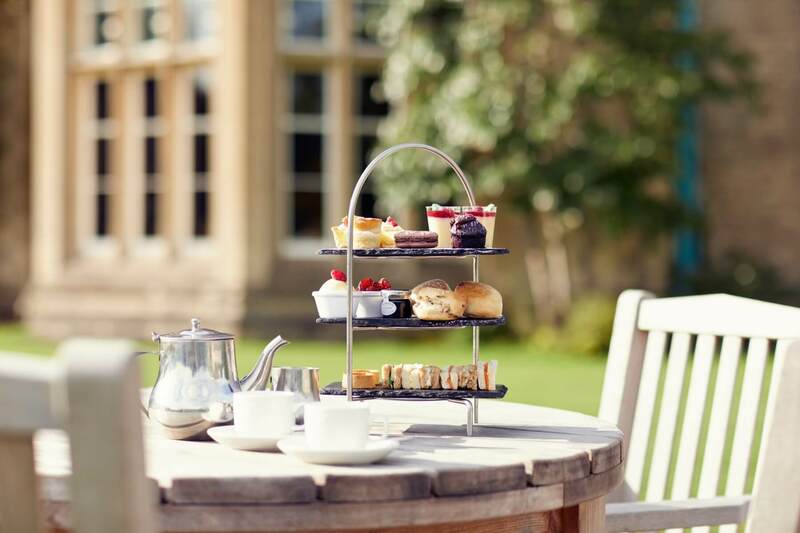 And if the summer weather has you craving the outdoors, De Vere Tortworth is serving an outdoors inspired menu, with local produce and hotel-grown herbs taking centre stage.